Joba Chamberlain’s Weight Gain: The First Mini-Controversy of the 2011 Season! 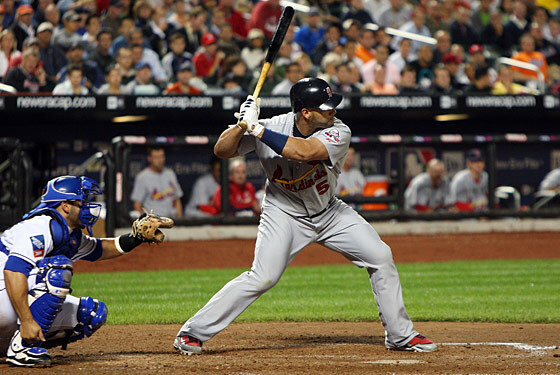 The artificial deadline for the St. Louis Cardinals and Albert Pujols to come to an agreement on a new contract passed at noon today, which means that Albert Pujols is still a member of the St. Louis Cardinals. It doesn't seem that way: It seems like he has already left. But he hasn't. What this means is that the years-long "it's tough to imagine him playing for anyone but the Cardinals" meme is over. You can certainly imagine him playing for someone else now. If you were a betting person, you'd probably still put money on Pujols eventually staying with the Cardinals, but that's more because the Yankees and Red Sox (presumably) will be out of the bidding. Clearly, Pujols wants to test free agency. This is what happens when your team is not the Yankees. We don't mean that disparagingly; we're shaken by our Cards not wrapping up Pujols today, but we're not mad about it and definitely not surprised. But in his press conference today, Cardinals general manager John Mozeliak, almost plaintively, pointed out that even though Albert Pujols and his people don't want to talk contract extension until the end of the season, he'd be open to the possibility. That right there is reason No. 73,239 why it's nice to be the Yankees. The Yankees, famously, refuse to negotiate with players who are about to be free agents during the season. They can do this because they are the Yankees. Because they have the most money, they can set the market on any player, and they can wait until all information is available. The Cardinals failed to wrap up Pujols early — the way the Twins did with Joe Mauer, for example — not because they didn't want to keep him around, but because they couldn't balance the risk (a $300 million, ten-year contract) with the uncertainty (knowing how many teams would be bidding, knowing how Pujols will play this year, whether he'll stay healthy, and so on). The Yankees never have to worry about that. At the end of every day, the Yankees can pay more than anybody else can, so they can let the market play out. The Cardinals were trying to avoid that. They failed. The Yankees refuse to negotiate with their free agents, even the Jeters, even the Posadas, until it's on their terms. The Cardinals — who have the ninth-highest payroll in baseball — can't even get their top free agent to talk to them until he has decided he is ready, until it is on his terms. The Cardinals didn't blow an opportunity today through mismanagement or disrespecting their superstar. They just aren't the Yankees.